The business end of a spark plug, a com­ponent of an in­ternal combustion engine. 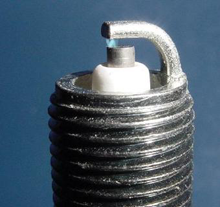 The spark plug is responsible for igniting the fuel-air mixture that fills the combustion chamber in each one of the cylinders of an internal combustion engine. The curved metal arm at the top of the photo is one electrode, and the central post, surrounded by a white ceramic insulator, is the other. A spark is visible arcing between the two electrodes. The electrodes of a spark plug provide a useful metaphor for understanding conflict in a human system. Both electrodes are necessary for sparking. Assigning greater responsibility to one electrode or another isn't a useful approach to understanding the internal combustion engine. Nor are the electrodes alone sufficient for sparking. A complex system consisting of wires, coils, a battery, an alternator, and much more, is absolutely necessary to make the spark jump the gap between the electrodes of the spark plug. So it is with most conflicts in organizations. The two people who play the roles of the electrodes are probably only part of the "circuit." Photo courtesy Auto Care Experts. Back in June, we looked at Part II of our collection of over-generalized adages — wacky words of wisdom (see "Wacky Words of Wisdom: II," Point Lookout for June 6, 2012). Here's a third installment. These words, due to Henry Ford, were probably meant to apply to manufacturing — specifically to assembly line work. They capture a belief widely held, especially in Western societies, that we can accomplish any complex task by decomposing it into smaller, more manageable tasks. But does it apply to tasks of absolutely every kind? Does it apply to medical diagnosis? Designing a flood control system? Formulating economic policy? Writing legislation? Division strategies are valid for a class of tasks that we might call divisible. But some tasks might be only partially divisible, or not divisible at all. For example, for some diseases or disease combinations, accurate diagnosis requires a grasp of the totality of a patient's health. When success depends on grasping the whole, or when success depends on grasping portions that seem at first to be unrelated, division doesn't work. What's worse, for indivisible tasks, determining divisibility is often itself an indivisible task. An increasing portion of all modern work just isn't divisible. Dividing indivisible tasks invites disaster. This adage is often used as a basis for infringing previously delegated responsibility, or for micromanaging, or for obsessive review of delegated work. These behaviors all contribute to nightmarish relationships between supervisors and their subordinates. indivisible tasks invites disaster.take this "advice" to heart have most likely misidentified the problem. They believe, incorrectly, that their problem is incompetent or negligent subordinates. More likely, the problem is that their standards are unreasonable; or standards are so fluid that subordinates cannot keep current; or standards have not been effectively communicated; or supervisor/subordinate relations have broken down; or the output quality assessment process is biased, unfair, or inaccurate; or the supervisor is determined to prove that only the supervisor is competent. These are only examples of a host of serious problems. All are extremely difficult to address unassisted. This widely believed but rarely articulated idea has a partner: "If everyone has difficulty working with X, the problem is in X." Both ideas are sometimes applicable, but only careful investigation can determine applicability. It's safest to keep an open mind about the source of the difficulty, pending investigation. Difficulty between any pair of people usually arises from complex interactions involving many others, including the team lead or the supervisor(s). It's rare — though possible — that one person or one pair of individuals is the cause of trouble. More often, everyone plays a part. For more examples, see "Wacky Words of Wisdom," Point Lookout for July 14, 2010, "Wacky Words of Wisdom: II," Point Lookout for June 6, 2012, "Wacky Words of Wisdom: IV," Point Lookout for August 5, 2015, "Wacky Words of Wisdom: V," Point Lookout for May 25, 2016, and "Wacky Words of Wisdom: VI," Point Lookout for November 28, 2018. Would you like to see your comments posted here? rbrenezKvkgWWIfSrGMjbner@ChacsRsTfVbtASWlssgioCanyon.comSend me your comments by email, or by Web form. I offer email and telephone coaching at both corporate and individual rates. Contact Rick for details at rbrenutBaosAkCLoTDPBGner@ChacemnNkuTxWMNbnLFdoCanyon.com or (650) 787-6475, or toll-free in the continental US at (866) 378-5470.